Friends till now we have published a lot of articles but this is probably the first article about Hacking. 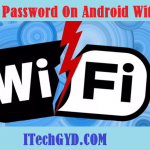 Here in this article, I will show you a simple and easy method to hack Gmail account easily even in 2019. 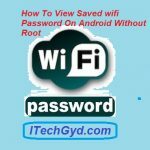 But this method is only possible if your friend or victim has not turned on second step verification for his Gmail, because you will get the email and password very easily but the verification code is difficult to get so, first make sure that your friend has not turned on the second step verification on his Gmail account. There are many other methods to hack Gmail account such as Phishing, Easy Phishing Data URL, Desktop Phishing, Your Page, and much more but CMD hacking is the simplest and the easiest method to hack into someone’s Gmail account. We are going to create a simple Keylogger or say spy software for this hack. After creating that software we will send that software to our friends either attaching that software with an email or by taking that into a USB. We will make our friends to open the software and to log in with his details when our victim will be logged in a new file will be created with the respective information such as friend’s email and password which he had entered. How we will open that file in edit mode and read the password. 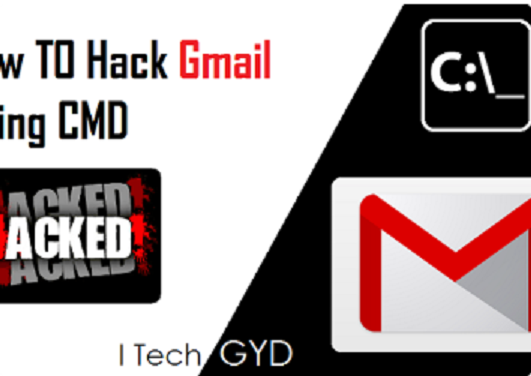 This is the simplest as well as the easiest method to Hack Gmail using CMD. 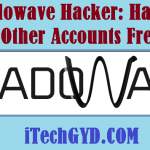 Disclaimer: This article is just for the sake of information and for study purpose, I did not intend that you hack someone’s Gmail account using this trick; this is just for showing you how someone can make you fool and can easily hack your accounts. SO if you do anything illegal then I Tech GYD will not hold responsible. 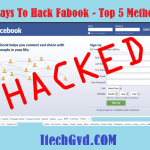 Recommended: Learn about the ways to hack a facebook account free. First, open a blank Notepad window; you can also use any other simple text editor as Word Pad or MS Office etc. To open a blank notepad go to Start >All Programs > Accessories > Notepad. OR press windows + R keys together and type notepad in the box and click on the run button. OR Search the notepad. Now copy all the code given below and paste it into the blank notepad window which you had opened in step 1. ECHO Sorry There Is A Problem With This Software Please Contact The Developers And Send Them Gmail File Created Now. 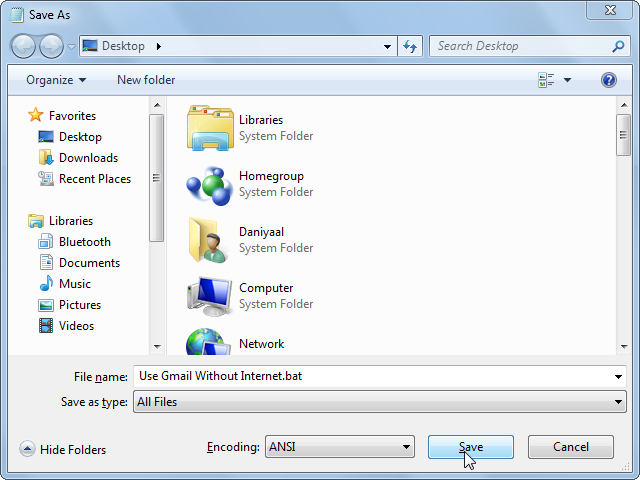 Now press CTRL + S or click on the file and then select Save As… in the save box name the file as Gmail without internet.bat (remember .bat is necessary) choose the file type to All and click on the Save button. Copy the recently created file into a USB or send this as an email attachment to your victim, and said him I have made a software which runs Gmail in a new interface with very fast speed even on a slow internet connect, he will not believe. So open the file and make him enter his email and password. When your victim (Friends) will enter the password as well as an email that will be saved in a new file that will be created itself after entering the email and password of your victim. Now copy the newly created file into your USB and bring that file to you, if you had sent this file to your friend via email then you can make his to send the second file to you, saying him there is a bug in the software and the second file can help you to remove the bug. After getting the file right click on the file and select edit, the password and Gmail which your friend has entered will be shown to you. So this was a simple and easy method to Hack any Gmail account using CMD even without knowing any commands or anything else. But there is a question. Why is this trick called CMD Hacking? Well, you had saved the file with the .bat extension, this extension represents CMD files that’s why we called this method CMD hacking. Please don’t use this method for harming someone. 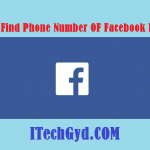 Press the like button below and share it with your friends. there would be some bug. they would fix it soon. it’s still working or not? according to some people (comments above) it is working. It is not working, It gives error while uploading the attachment, it shows the server blocked the attachment due to have a virus codes. Please help me . am using google chrome. Without ANY of the information!!! Can you pleas help me with my issue?! The file can’t be attached. 2nd file is opened but it is empty??? what happened?? its working please remove double invertet commaa “” from mail and pass. its work show email and password how to login gmail account. try to recover via your phone or security questions etc. please, tell me how the exactly codes so I can send the password from Command Prompt towards email address. With lakshya’s remedy, it now works. Thanks! privatehacktion at geemail dot com to me.They are a team of certified hackers who knows a lot about what they do. I strongly recommend you hire them because they are the best out there and always delivers. I have referred over 45 people to them and all had positive results. They can help hack into any devices, social networks including – Facebook, Hangout, iMessages, Twitter accounts, Snap chat , Instagram, Whatsapp, wechat, text messages ,smartphones cloning,tracking emails and also any other social media messenger or sites. It’s advisable to hire a professional hacker.Thank me later. try sending via other methods listed above. IT IS WORKING GOOD ! Inbox me if you need a professional hacker to hack your login and password for you…gmail, Facebook,bank login and Info’s,other emails,any site….